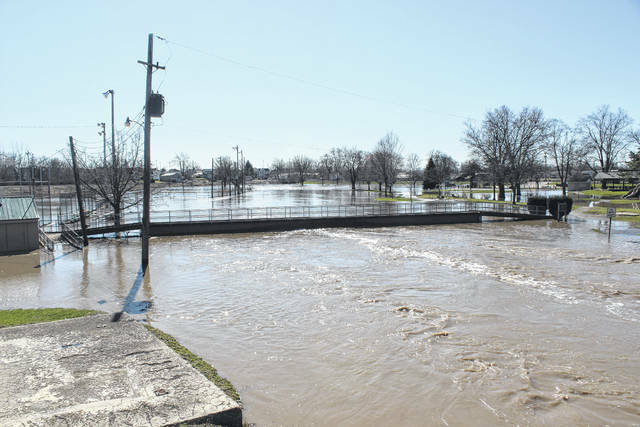 Following a weekend of rain, many parts of the county sat in water Monday, including the area around Paint Creek as it flows into Washington Park and Eyman Park in Washington Court House. Flood waters filled the parking lot where the city swimming pool was located and some residential yards around the county had several inches of standing water. According to weather.com, the county should expect more rain to come on Wednesday and Thursday accompanied by temperatures above 50 degrees. https://www.recordherald.com/wp-content/uploads/sites/27/2018/02/web1_IMG_1489.jpgFollowing a weekend of rain, many parts of the county sat in water Monday, including the area around Paint Creek as it flows into Washington Park and Eyman Park in Washington Court House. Flood waters filled the parking lot where the city swimming pool was located and some residential yards around the county had several inches of standing water. According to weather.com, the county should expect more rain to come on Wednesday and Thursday accompanied by temperatures above 50 degrees.